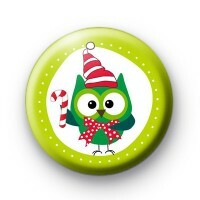 Bright green Festive Owl Badge. This 1-inch badge is super festive and has a cute owl wearing a festive hat and is carrying a candy cane, you have to admit it is very festive. Why not include our handmade badges in your secret Santa gift or handout to colleagues at work to spread a little festive cheer. If you're looking for other Christmas designs we have over 600 to pick from including classic Santa, Snowmen and even snowy Penguins. We also have a huge selection of Festive slogans.